Wondering about Plans on Christmas Eve on 24th Dec.17 (Sunday)? Get Ready to witness the Biggest & Craziest Party Bash on Sunday Night @ The Liquor Factory, Andheri (W). 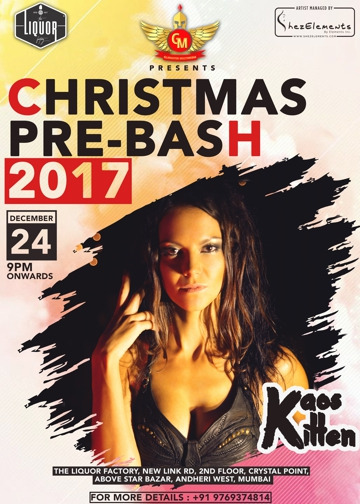 Gladiator Multimedia is in town to kick things up a notch and rock the party with Christmas Eve Pre Bash 2017. The event would be featured at one of the best luxurious restaurant, The Liquor Factory. Come and feel the beat with various food and drinks. #Dance #Music #Bollywood #EDM #Hip-Hop #Enjoying #Drinks #Food #Sheesha. Its Christmas time. Eat, Drink and Be Merry. Make this December to Remember. Limited passes available. Collect a.s.a.p. - Watch out for your captured after party Videos & Pictures on Facebook.